I recently put together a bucket list as a goal to visit my favorite course designers Coore and Crenshaw. 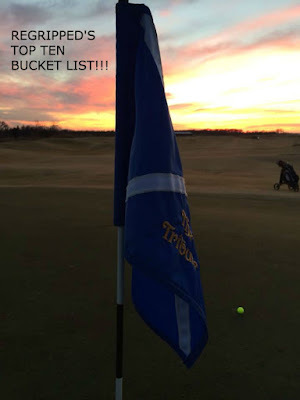 It got me thinking, what would be my bucket list of Top 10- must play courses? You know, the ones that if you got invited to play you would hop on a plane and fly across the country or the world to play. THOSE ones? Before we get to the courses, here are some that are in the "close but not quite" category. 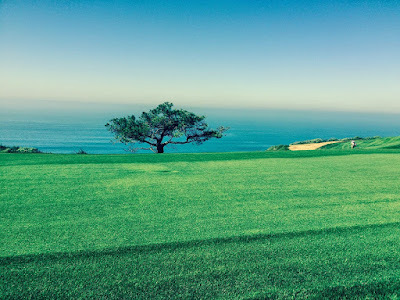 Places I would love to play but just didn't make it: Torrey Pines (North and South), Royal Melbourne, San Francisco/California Club/Lake Merced, Lahinch, Makai, LACC, the Quarry, Streamstrong (Red), Bethpage (Black), Pacific Grove, Cabot Cliffs, Kapalua, Pasatiempo and Cruden Bay. In looking through my list below, one thing is clear, I have a thing for the sea. Most of the courses that DID make it (with two notable exceptions) have links to the sea, whether as a true links course or at least you can enjoy links sausages near the sea. There is something about the sea air and the views which put these courses over the edge for me. With that proviso, awaaaaaay we go! 4. Augusta National (USA): The only non-links course on this list but on this list for a reason. There are three reasons to play Augusta 1) The history. Freddie's chip staying up on 12, Nicklaus in 86, Jordan destroying the course. 2) This course is the gold standard for green. Of course, this has some lousy consequences as other courses spend way too much water and fertilizer but to play the original immaculately maintained course must be a thing to behold. 3) The exclusivity. To make this list a course gets on here party if you get a call to play you go, no questions asked. I doubt anyone in the golf community would ever hang up on a call from Augusta. 2. Sand Hills (USA): One of the ultimate links courses and yet it is not anywhere near the ocean. In fact this course is in the middle of Nebraska. An ultra exclusive club that is super tough to get on but super worthwhile. Just check out this glowing review! Triple bonus points goes to the fact that Coore and Crenshaw designed this beauty which puts it close but not number one on my list. 1. Cypress Point (USA): This course has it all. An iconic hole? Check. An amazing stretch of holes by the sea that are immaculately cared for and almost every hole memorable? Check. What puts this course over the top of all others is the exclusivity. Almost no one can play this course unless you know a member and get a coveted invite. I have no idea who is a member of this course or how I could get on but my golfing life would be complete if I could play this track. This course is the very definition of fly-and-play as soon as the phone rings. So, that's it, that is the list. Overall I think a pretty good collection eh? What's on your list, what's numero uno? Tell me in the comments!